I lived a double life for nearly a decade prior to enrolling at Monmouth in 2002. When school was in session, I was a quiet, underperforming student who always had his nose in a book; the type bullies loved to pick on and teachers shook their heads at in pity. I had no formal study in computing, nor was any such education readily available to secondary school students at that time. I developed a reputation for not completing assignments; my grades were consistently yet artificially abysmal. Yet I would arrive home, and instead of watching television, doing my homework, or rushing out to play field hockey, I would program for hours on end. Wonderful things would spring from this time at the keyboard, which I had to keep secret: two online games with user counts in the tens of thousands, a working alpha-beta pruning AI, modest encryption and compression algorithms, and a chat (IRC) client among them. No breach was made in either direction between these two worlds. Despite knowing I wished to study computer science from a very young age, my college prospects were not good, and if I hadn’t been accepted to Monmouth, I probably would not have gone to college at all. Thank goodness I was! Monmouth at last provided the unification I needed. The faculty’s passion for learning and dedication to the students were truly remarkable. There was an air of optimism about the entire campus: people were doing amazing things here! Set on becoming a software developer from childhood, Monmouth challenged me to look farther: to become not only the best developer I could be, but to acquire new skills and a broader perspective - to achieve my full potential across fields and become the best person I could be. In thriving by my own goals, I also thrived academically – there was no longer a divide. Even more importantly, Monmouth cast the single laser-focused, but inauthentic goal I had previously made of my study under self-scrutiny. It was impossible to remain insensitive to the beauty and interconnectedness of the knowledge I was regularly exposed to with all of the amazing students and faculty surrounding me. Inspired by the faculty across mathematics, music, the natural and social sciences, communications, and the humanities, I became, by my own choice, an active participant in my own learning - not just in computer science, but everywhere. This led me to one amazing opportunity after another, from picking up piano and composition, to learning that I loved mathematics, tutoring, and teaching in the Mathematics Learning Center, to spending hours formally recognizing and stating my new personal philosophy, to ultimately becoming involved in academic research. Everyone was amazingly supportive, yet provided a continuous challenge to reach ever further – the perfect environment for personal growth. The School of Science itself was very helpful, providing opportunities to participate on campus in meaningful ways, such as the annual Student Research Conferences and the Student and Alumni Advisory Council. My first research opportunity, in symbolic artificial intelligence with Dr. Scherl, proved critical. I can’t stress enough the importance of undergraduate research: if you get the chance, do it. This ultimately paved the way for me to begin conducting my own independent data structures and number theory research, and (after realizing that, though valuable, it was very ad-hoc) directly fueled a desire to enroll in a PhD program following my graduation. Unfortunately, this was a rocky road from the start. Armed with a focused research proposal and nigh-perfect numbers, I applied to several top-tier schools; not a single one accepted me as a doctoral student. These schools claimed the founders of the discipline and carried the torch of fundamental algorithms research; lacking entry, I was shut out from the basic algorithms questions I wished to pursue. I instead looked for AI programs which emphasized medical research, combining two passions. Perhaps I would not acquire the skills to solve P=NP, but gaining the ability to predict the future and read minds seemed like a fair compromise. Ultimately, I enrolled in a Computer and Information Sciences PhD program at Temple University. There I applied machine learning to medical image diagnostics, ultimately developing systems capable of diagnosing tumors in mammograms and brain MRIs with approximately 90% accuracy, and an fMRI system capable of distinguishing between left and right-handed individuals based only on their brain activation patterns. I also learned a few life lessons: everyone wishes they knew more math in graduate school, a PhD program is essentially a research apprenticeship, the world is really more like high school than college, and not even a volcanic eruption grounding all air traffic in Western Europe will stop your committee from being present at your defense. During my third year in the PhD program, I had the opportunity to return to Monmouth as an Adjunct Professor in Computer Science, teaching the undergraduate and graduate courses in Data Structures and Algorithms. Teaching was an incredible experience! My time at Monmouth had prepared me well: guided by my own experiences and revelations as a student, I focused my teaching approach around inspiring students to think broadly, uniquely, and creatively about topics, guiding them to discover the intuitions behind the topics, and challenging them to extend the applications of their knowledge into new areas. One of my most gratifying experiences was returning to the university for the 2011 Student Research Conference and seeing the same students presenting fully mature and novel implementations of ideas they had hit upon in the course or grappled with in their course projects. 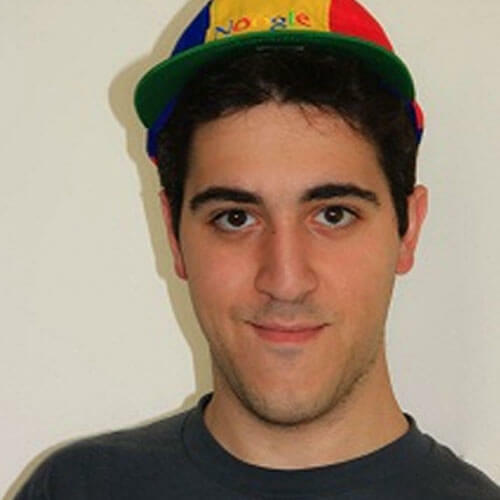 Following an April 2010 graduation that left half of Europe covered in ash, I began applying my data mining and software development knowledge in industry, first as a Data Scientist for a small social advertising company called Media6Degrees, then as the Lead Software Developer for an event recommendation startup called Wixity, and finally as a Software Engineer for Google. At Google, when I’m not riding around on scooters or playing in the ball pit, I work on the internal development tools used to build and test Google’s software. Students frequently ask me, “How do I get a job at Google?” Paradoxical as it may seem, having reached career nerdvana, my advice is to avoid making a job the purpose of your life, education, or philosophy. Worry about “being your authentic best”, invest in the self-discovery, effort, and persistence required to get there, and ,eventually, even the most coveted jobs will literally just come to you without effort. But make sure you can be found! Keep a LinkedIn profile and an updated copy of your resume on your personal website where search engines can see it. Finally, conquer your fear of failure: it is a recurring theme in any successful career. I wasn’t hired on my first interview with Google, and I did not receive my successful second opportunity for another three years. Ultimately, in place of my prior goal of developing software, Monmouth has inspired me to two purposes, for which development is only a stepping-stone: to advance education and to perform lifesaving medical research. Of the opinion that life goals are not to be shelved for any length of time, I am active in both areas: the first through an initiative to create a school for interdisciplinary reasoning and radically creative problem solving called Project Polymath, and a step toward the second through a mammographic diagnostic program which can exceed the accuracy of an average radiologist, tentatively under the trade name of Living Discoveries, LLC. Those primary purposes aside, I’ve also branched into piano, composition, photography, electronics, and philosophy as a direct result of my time here, having realized that breadth of knowledge need not require sacrifice of depth.